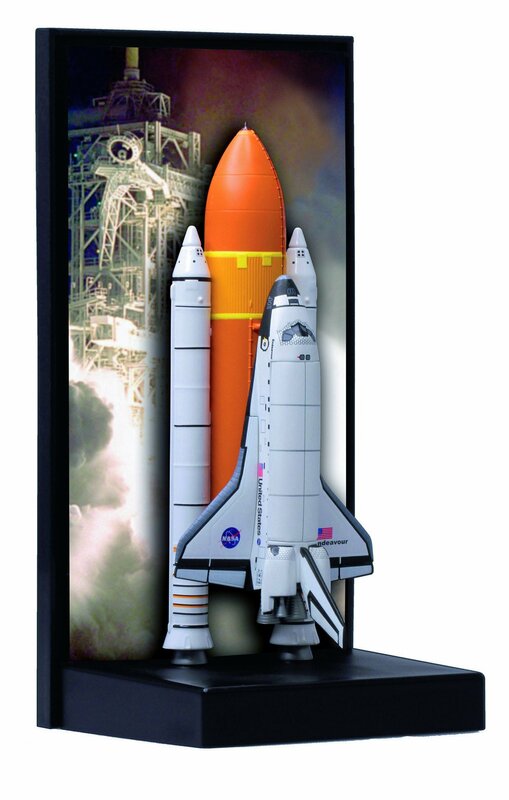 Home › Toys › Dragon Models 1/400 Space Shuttle "Endeavour" With Srb Sts-88 - Memorable Mis..
Dragon Models 1/400 Space Shuttle "Endeavour" With Srb Sts-88 - Memorable Mis..
Endeavour (OV-105) was the final of six Space Shuttles to be built by RockwellInternational, and its construction was authorized by the US Congress in 1987.It was produced as a replacement for Challenger, which was lost during in atragic launch accident in 1986. Endeavour utilized structural spares left overfrom construction of Discovery and Atlantis, as it was deemed cheaper to buildthe final Space Shuttle from spare parts rather than produce an entirely newcraft. Endeavour took its name from the British ship that Captain James Cookused on his first voyage of discovery in 1768-71. Endeavours first flightoccurred in May 1992, and its final journey to the International Space Station(ISS) took place in May 2011. Its 20-year career encompassed 25 forays intospace. The latter half of its series of flights revolved around trips to theISS.It was scheduled to conduct the final Space Shuttle mission, but this tasklater fell to Atlantis. Instead, Endeavour performed the penultimate missionbefore the entire Space Shuttle was retired in 2011. The craft will eventuallybe exhibited at the California Science Center. From the Manufacturer Endeavour (OV-105) was the final of six Space Shuttles to be built by RockwellInternational, and its construction was authorized by the US Congress in 1987.It was produced as a replacement for Challenger, which was lost during in atragic launch accident in 1986. Endeavour utilized structural spares left overfrom construction of Discovery and Atlantis, as it was deemed cheaper to buildthe final Space Shuttle from spare parts rather than produce an entirely newcraft. Endeavour took its name from the British ship that Captain James Cookused on his first voyage of discovery in 1768-71. Endeavour's first flightoccurred in May 1992, and its final journey to the International Space Station(ISS) took place in May 2011. Its 20-year career encompassed 25 forays intospace. The latter half of its series of flights revolved around trips to theISS. It was scheduled to conduct the final Space Shuttle mission, but thistask later fell to Atlantis. Instead, Endeavour performed the penultimatemission before the entire Space Shuttle was retired in 2011. The craft willeventually be exhibited at the California Science Center.